We did not witness this avalanche. We saw a lot of trees felled and broken. Trees that I remember seeing a few days earlier when i climbed the GWI. 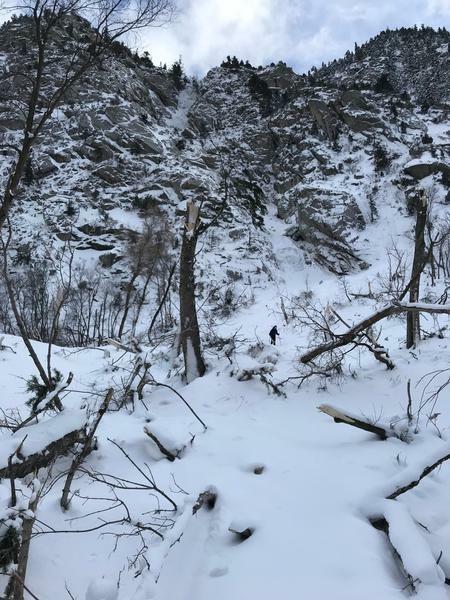 this avalanche had incredible force and tore many trees. This avalanche must have happened on 2/6 or 2/7. GOOD CALL YOU GUYS on closing the GWI on that day!!! Forecaster Comment: Just to be clear, we did not close the Great White Icicle. We recommended that traveling in avalanche terrain was NOT a good idea. The only public entity that can close the canyon for snow and avalanches is the Utah Department of Transportation. Thank you for the great picture and comments. Big avalanche!